Beautune -- Bring out the best you! 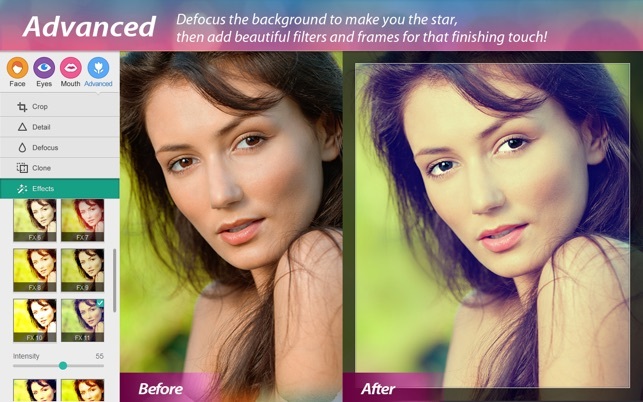 • From the makers of Fotor, the #1 free photo app in over 50 countries within the the Mac App Store. You can’t always look your best in every photo... 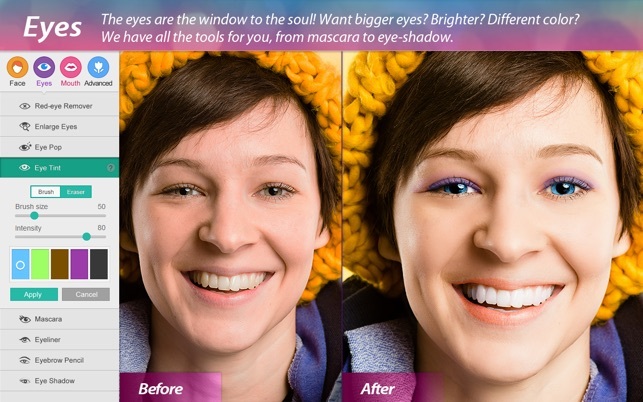 When you do need a touch-up, you don’t need to pay a makeup artist or learn Photoshop. Do it yourself, quickly and easily, with Beautune and our complete makeover kit. 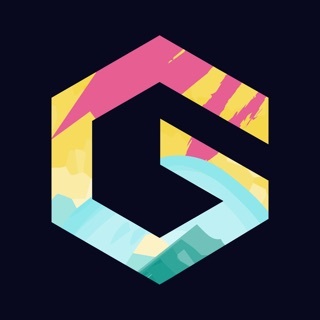 Our app has the best interface that will quickly let you share the best of you with the world. • Use the foundation brush for a perfect, even look. • Add some blush to highlight your beautiful cheekbones! 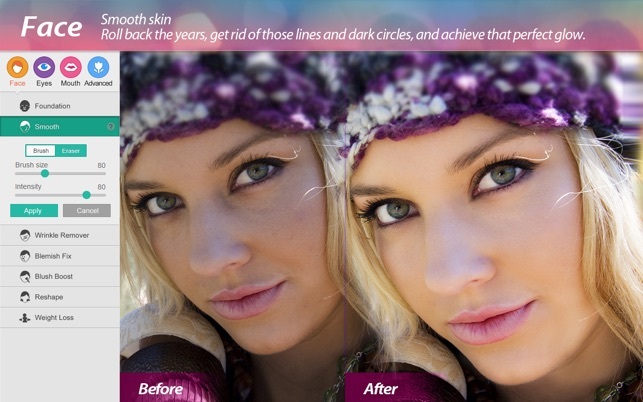 • Smooth skin: Roll back the years, get rid of those lines and dark circles, and achieve that perfect glow. • Blemish removal: Remove those zits and imperfections quickly and easily. • The eyes are the window to the soul! Want bigger eyes? Brighter? Different color? We have all the tools for you, from mascara to eye-shadow. 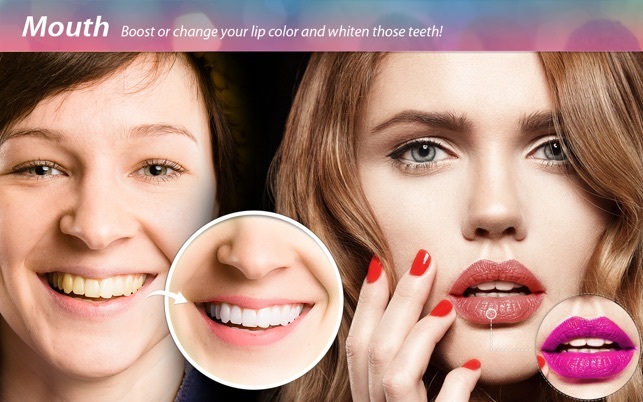 • Boost or change your lip color and whiten those teeth! 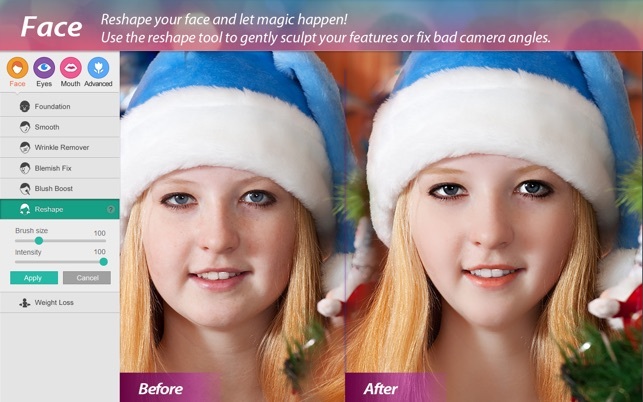 • Use the reshape tool to gently sculpt your features or fix bad camera angles. • Focus on what’s important, you! Use our defocus tool to blur out the rest and make the viewer see what matters. • Finish your masterpiece off with great-looking filters and frames, then email it out or share it on your favorite social network. Beautune is fully optimized for retina displays, allowing you to view and edit your high-resolution photos in all their glory. Send your photos to iPhoto, Facebook, Twitter, Flickr and Email, all from within the app. Then print your masterpiece to really bring it to life. Great simple to the point software! Only one thing for me (a basic user) is missing. There is no option to zoom in on images, this is must for images that are not as big. I tested it out and discovered this issue, but my testing was on a smaller image. I do web design and do edit images, but am pretty much basic with it. The zoom in issue wouldn’t bother me so much becaus in real life I expect to be editing much larger images. However, this feature should be there so users can click precisley where they want to. 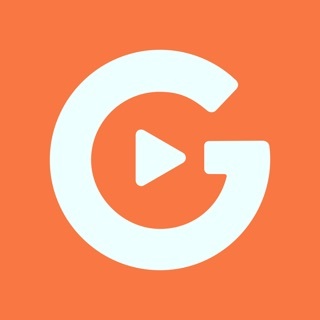 But in my testing this app works great. So I hope to see the zoom in options. I still gave 5 stars for this because it works as advertised! This program is great! It would be nice if it didnt crash every few minutes. So if you enjoy editing a photo and then it not saving and so you have to edit it again but then this time it crashes halfway through so you have start again but this time it crashes as soon as you open the photo then you will really like this app. IT IS THE MOST FRUSTRATING THING EVER AND IM SO DONE. I used to love his app for editing my photos. Used it all the time. Then it just stopped working. I would edit a photo but the app wouln’t save it, export it, it would just quit. I even bought the new app thinking that would solve the problem but it didn’t. I emailed the company several times asking for help but they never responded. I can’t use it anymore so basically it’s useless to me. What a shame & what a waste.